BVI Airways, Inc has filed for an exemption to the US Department of Transportation for permission to conduct scheduled foreign air transportation of persons, property, and mail between the prescribed UK Caribbean gateway points via intermediate points, to points in the United States and beyond. The two carriers are petitioning the application with claims that they were not provided with a copy of the BVI Airways application although the proposed service would affect their operations. They also cited the local Govenment's plug of $7M into BVI Airway is likely a conflict of interest. Who are the players in BVI Airways? It is in this petition that answers what many persons residing in the Virgin Islands (UK) have been seeking for some time now - Who are the players in BVI Airways? 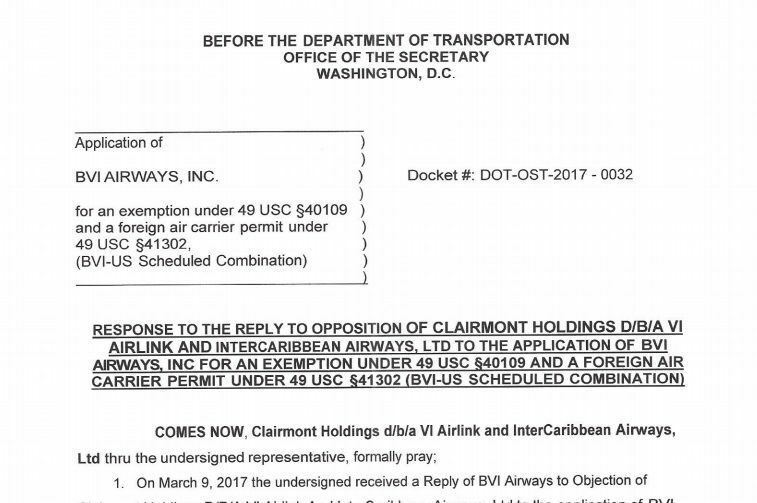 According to VI Airlink's petition, a document in our newsroom's possession, BVI Airways did not comply with the requirements of the rules. 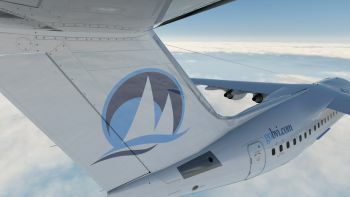 They alleged that when indicating the ownership and management of the applicant they established that their (BVI Airways) owners were Pauline E. Jones with 31.0% ownerships, Bradley David Goggin with 20.0% ownership both being UK/BVI Residents while US citizen Colchester Aviation, LLC had the remaining 49.0% ownership. What's wrong with the ownership picture in the eyes of VI Airlink? "An applicant for permanent residence must reside in the Virgin Islands consecutively for a period of 20 years before application can be considered. An applicant can only be absent from the territory for 90 days in any calender year except when persuing further education or as a result of illness. Applicant must state in his/her application intentions for residing permanently in the territory and dependants who are endorsed on their parents' certificate should apply for their own certificates six months before their eighteenth birthday, if they wish to continue residing, permanently." 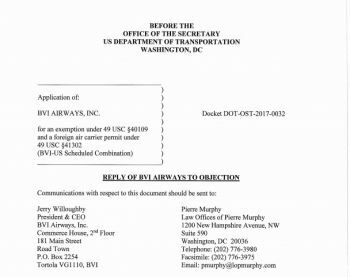 VI Airline also sought to prove that the owners of BVI Airways that account for 49% shares is also a US citizen as cited in the State Department of the State of Florida and their key executives are executive officers and Directors Mr Jerry D. Willoughby and Mr Scott A. Weisman and General Counsel Mr Micheal Long. 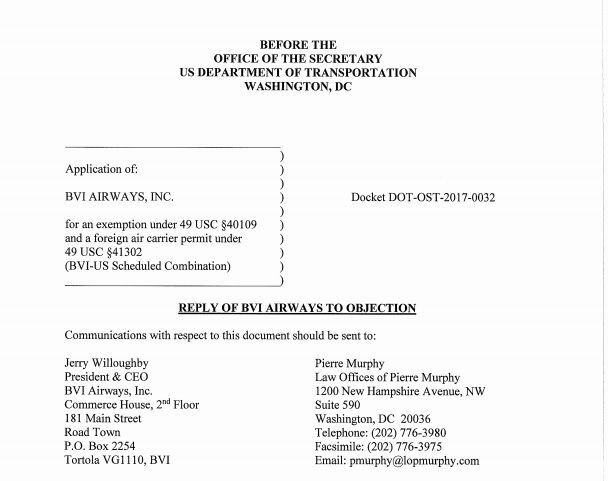 However, in reply to the objection made by VI Airlink, a document also in our newsroom's possession, BVI Airways ‎expressed that VI Airlink was not prejudiced in anyway by not being served a copy of the BVI Airways' application. "However, the very regulation cited by the objector indicates that (potentially) competiting foreign air carriers are in fact not required to be served. Regardless, the objectors appear to have been made aware of the BVI Airways application, which is in a public docket and they do not appear to have been prejudiced in any way," cited BVI Airways through its legal authority. As it relates to the claim of governments financial injection to BVI Airways the company defended by stating, "Objector's (VI Airlink) only other argument appears to be an inference that BVI Airlines somehow has misrepresented it's relationship with its homeland government, providing links to a number of press articles going back to 2014. However, nothing in those press articles is inconsistent with the BVI Airways' representations. Which objectors quote, regarding any relationshio with the government of this tiny isolated caribbean Island." The BVI Airways contended that there is no partnership in any legal sense with the government of the VI. "It is incredible that VI Airlink, like applicant herein a carrier of the BVI, which itself is subsidised by the government of the BVI as part of the government's efforts to develop aviation services to this isolated small island, should choose to raise this argument before the US Department of Transportation. A foreign air carrier proceeding is hardly the place to resolve the "...big conflict of interest between the other local carriers in the BVI (ie: BVI Carrier) and the (ir) government." BVI Airways also mentioned that VI Airlink has been licensed for many years for US charters and most recently scheduled service with small aircraft but thus far never operated any services to the US mainlands. The company is appealing to the US Department of Transportation to reject VI Airlink's objection labeling it ‎as a delay tactic. In an open letter to the people of the Virgin Islands (UK), Chief Executive Officer of BVI Airways Jerry D. Willoughby said they are highly disappointed that the collective investments of time and capital to make non-stop service to Miami, Florida a reality has been recklessly placed at risk for political gains and greed. "The false claims made on the floor of the House of Assembly accusing BVI Airways of unpaid obligations, insider trading and unscrupulous business practices are patently false, lack any legal basis, and are an affront to our hard-working employees and the many Virgin Islanders in both the public and private sectors who have toiled long and hard to bring this venture to reality. Moreover, VI Airlink’s baseless, anti-competitive and fraudulent objections to our service to Miami will delay the launch and increase the pre-operating financial losses significantly," Mr Willoughby stated in a press release recently. BVI airways saying that they are not in partnership with the BVI Government but our Premier telling us that he entered a partnership with BVI Airways. Well who lying? Partnership and Investment are two different things. BVI Airways, whether a BVI or USA corporation can have directors/stockholders from any country. Who cares? This is such petty nonsense. NDP is just messy all around. I don't know how we allow them to still sit in office. Only in the BVI. 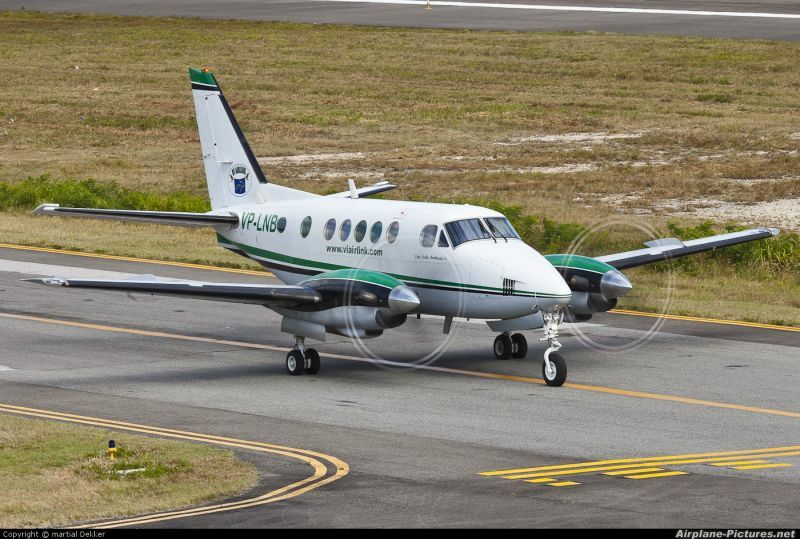 It appears that this company is a USA corporation, has leased these planes and has accepted a loan to the corporation of 7 million dollars from the BVI government. It has no local stockholders nor does it have to. I would hope that people get out of the way and allow them to run the airline and start service. so you mean my $7 million down the tube? The loan is an incentive to start the airline and commence service to/from BVI to Miami. Easy to understand! Can I get a subsidy for my business as well? VI Airlink probably got over 7 mil from govt by now qith all the subsidies for Antigua and elsewhere. Dont be fooled by the word play. How Doc going to explain this one? Did you look at the full contract the government has with BVI airways? Go to regulators.gov. What it looks like is that BVI Airways is declaring that 100% of its shares are distributed to two UK/BVI Residents and a corporation with no US citizens involve (a big lie!). What you probably didn't read in the agreement is that BVI airways will return 10% of the shares to whoever the "bvi government designate at their discretion" but this can only happen after a certain period (e.g. after 3 years of profit). Does this look like corruption or fraud in the making? These things will never come to light if VI Airlink didn't kick up a storm. Looks like a competitive advantage and declared interest by an unknown "government designated person". I'm sure the public will not be offered any of this 10% share. It appears it going to be a hell of a corruption if this government get their hands on the airport project too. NDP government pimping our tax dollars on these jokers like a prostitute. All the money gone in the airy bank and nothing in return. Now them using an irrelevant excuse saying that the alleged claim by our true local ailine VI Airlink is to cause a delay. Well if I was in the US FAA Board to make a decision the evidence will be crystal clear. The new airline had a few projected launch dates and NON came to fruition. VI Airlink was not even in the picture then. Now blame the delay on them thinking that the people of the VI will forget. White collar crime at it's best. 1. BVI Airways felt they could side step the other local service providers (VI Airlink) because they have our Government on their side and don't need to answer to anyone. They didn't follow procedure to serve their competitors knowing they should as an experienced service provider. - the us department of transportation agrees with VI Airlink. 2. 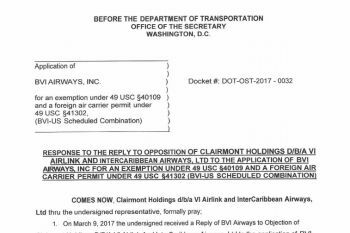 BVI Airways try to pull a fast one on the US regulators to get they application approve knowing well the shareholders are all foreigners. 3. VI Airlinks feel it's own local government is pushing their business down by injecting money in a 100% foreign owned company - the $7 million of tax payers money. - the us department of transportation is concerned and looking into this. Their policies are fair and balance. 4. VI Airlinks which is 100% locally owned is concerned they wonder since when foreign companies get such boost and them privileges when local businesses have to deal with their own expenses. - vi Airlinks like all BVIslanders wondering if it's foreign companies or local companies first. 5. VI Airlinks is wondering whatever happened to a TENDERING process. 6. VI Airlinks is concerned and wonder how BVI Airways getting all the perks: free local office, free staff and concierge, priority landing space, tax free, NHI, custom duty free on everything. 7. VI Airlink is wondering about this 10% shareholding in the agreement between BVI Airways and the Government. (Nobody knows who going to get a little benefit -MAJOR CONCERN- the local people will not have any say in this or will know when it happens). 8. BVI Airways is indemnified in the agreement with the Govt from every thing you could think of. 9. BVI Airways have nothing to loose. The Govt is unlikely to fulfill some of there absurd requests in the agreement with the Government. The BVI people have already lost $7 mil with no sight of getting it back anytime soon. BVI Airways can and will sue this Government any day. 10. BVI Airways have no respect for house of assembly members. The Government bears full responsibility for the actions of BVI Airways. Dr ZZZZZZZ should be ashamed, but then that would require that he and the gang be capable of being ashamed. If this BVI Airways melee doesn't demonstrate the moral and intellectual bankruptcy of the National Democratic Party, nothing will. So leader of the Opposition was right all along the way. You have no idea what you are talking about. Ask VI Airlink how much this NDP GOVT has given them in the firm of subsidies over the past few years. $7 mil is peanuts when it comes to aviation. Get behind me Satan. You seem to be another crony that benefited. Don't you think people can read. Only you want to stay in the dark the money sweet don't it. I urge everyone to educate themselves. Look at what you were made to believe then look at the agreement the ndp administration sign and then what BVI Airways telling the us department of transportation and then their bold two face disrespectful letter. It would be an eye opener and a better means to understanding if the Gov would make public the amount in dollars and cents they have so far provided ViAirlink free and clear so.much so that they have expanded their business and net worth without having to repay one dime and with no shares to the Gov .No give back to the community despite dire needs at the hospital schools and family services. A clear case of personal enrichment with welfare funds. Time for the Gov to plug this drain and do what is necessary to move forward as a business and bid farewell to clueless parasites. Yes why don't you ask them how much they provided to VI Airlink. It definitely can't even come up to half a million! Stop listening to gossip and get the facts. At least Ryan has some. Whom ever Amelia Earhart is and whomever is attacking Ryan need to go and start educating their selves about the laws of the air in order to decipher what is right and wrong! Suffice to say VI AirLink is still in business because of the Gov. generosity. Karma will take care of VIAirlink so bye bye . We are still slaves...VI Airlink should be happy with the pittance they have received and keep quiet while they watch their Government subsidise a foreignor to the tune of 7 million? Really? You know what good about this is that the documents are all on regulators.gov DOT Docket DOT-OST-2017-003. So you can twist up this event all you want. One thing for sure is that our people are good readers and can genuinely form their own views. This is what the opposition was calling out for a long time - TRANSPARENCY. White collar crime, cronyism, preferential treatment, victimization, hypocrisy, corruption, disrespect, greed, abuse of power are all the order of the day. If you are benefiting then for Christ sake please consider the entire population who are and will be affected by the government's malpractice. When will VI Airlink tell us how much money they have received from Government thus far in the form of subsidies for flying to Antigua, Anegada etc.? Since when a BVIslander or Belonger need to compete against a foreigner for a job or contract? And if it involves government since when contracts are not tendered? I am with VI Airlinks 100%. Let them kick up a storm!! At the end of the day they only protecting they business. They give all we transparency and hold doc and he gang accountable. It's their God dam rights!!!! I have extra popcorn anyone? Enough said!! !